Download a blank fillable Dd Form 2772 - Contract Discrepancy Report in PDF format just by clicking the "DOWNLOAD PDF" button. 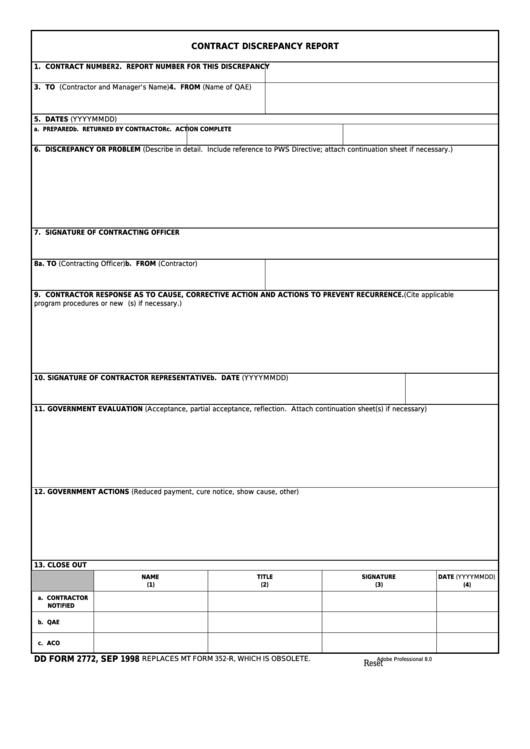 Complete Dd Form 2772 - Contract Discrepancy Report with your personal data - all interactive fields are highlighted in places where you should type, access drop-down lists or select multiple-choice options. 9. CONTRACTOR RESPONSE AS TO CAUSE, CORRECTIVE ACTION AND ACTIONS TO PREVENT RECURRENCE. (Cite applicable Q.C. REPLACES MT FORM 352-R, WHICH IS OBSOLETE.